Daniel K. Inouye International Airport (IATA: HNL, ICAO: PHNL, FAA LID: HNL), also known as Honolulu International Airport, is the principal aviation gateway of the City and County of Honolulu on Oahu in the State of Hawaii. It is identified as one of the busiest airports in the United States, with traffic now exceeding 21 million passengers a year and rising. The airport is named after the U.S. Senator and Medal of Honor recipient Daniel K. Inouye, who represented Hawaii from 1963 until his death in 2012. The airport is located in the Honolulu census-designated place three miles (5 km) northwest of Honolulu's central business district. Main roads leading to the airport are Nimitz Highway and the Queen Liliuokalani Freeway of Interstate H-1. Daniel K. Inouye International Airport serves as the principal hub of Hawaiian Airlines, the largest Hawaii-based airline. It offers flights between the various airports of the Hawaiian Islands and also serves the continental United States, Canada, Australia, New Zealand, American Samoa, Tahiti, Japan, China, Taiwan, the Philippines, and South Korea. It is host to major United States and international airlines, with direct flights to North American, Asian, and Pacific Rim destinations. In addition to services to most major western cities and many smaller gateways, especially in California, the airport has succeeded in attracting long-haul services to the East Coast including the recently added destinations of TorontoPearson and WashingtonDulles, which have joined established services to Atlanta, New YorkJFK, Newark, and Boston. It is also the base for Aloha Air Cargo, which previously offered both passenger and cargo services under the name Aloha Airlines. This airline ceased passenger flights on March 31, 2008, and sold off its cargo services to Seattle-based Saltchuk Resources, Inc. (also owners of inter-island sea-based shipping company Young Brothers and Hawaiian Tug & Barge). In 2012, the airport handled 19,291,412 passengers, 278,145 aircraft movements and processed 412,270 metric tons of cargo. It is included in the Federal Aviation Administration (FAA) National Plan of Integrated Airport Systems for 20172021, in which it is categorized as a large-hub primary commercial service facility. HNL opened in March 1927 as John Rodgers Airport, named after World War I naval officer John Rodgers. It was funded by the territorial legislature and the Chamber of Commerce, and was the first full airport in Hawaii: aircraft had previously been limited to small landing strips, fields or seaplane docks. From 1939 to 1943, the adjacent Keehi Lagoon was dredged for use by seaplanes, and the dredged soil was moved to HNL to provide more space for conventional airplanes. The U.S. military grounded all civil aircraft and took over all civil airports after the attack on Pearl Harbor, and Rodgers Field was designated Naval Air Station Honolulu. The Navy built a control tower and terminal building, and some commercial traffic was allowed during daylight hours. Rodgers Field was returned to the Territory of Hawaii in 1946. At the time, at 4,019 acres (16.26 km2), it was one of the largest airports in the United States, with four paved land runways and three seaplane runways. John Rodgers Airport was renamed Honolulu Airport in 1947; "International" was added to the name in 1951. Being near the center of the Pacific Ocean it was a stop for many transpacific flights. By 1950 it was the third-busiest airport in the United States in terms of aircraft operations, and its 13,097-foot (3,992 m) runway was the longest in the world in 1953. In summer of 1959 Qantas began the first jet service to Honolulu on its flights between Australia and California. Qantas introduced these jet flights with Boeing 707 aircraft operating a routing of Sydney Fiji Honolulu San Francisco. Aeronautical engineer and airline consultant, Frank Der Yuen, advised in the design of the original building and founded its aerospace museum. The original terminal building on the southeast side of runways 4 was replaced by the John Rodgers Terminal, which was dedicated on August 22, 1962 and opened on October 14, 1962. From 1970 through 1978, the architect Vladimir Ossipoff designed a terminal modernization project that remodeled this terminal and created several additions, which included the Diamond Head Concourse in 1970, the Ewa Concourse in 1972, and the Central Concourse in 1980. Pan American World Airways (Pan Am) used Honolulu as a transpacific hub for many years, initially as a connecting point between the West Coast and Polynesia (Fiji, New Caledonia and New Zealand) in 1946, followed by service to East Asia through Midway Island and Wake Island from 1947. By 1960, Pan American was serving the airport with Boeing 707 jets. Pan Am flight number 1 operated with a 707 flew a westbound routing of San Francisco Honolulu Wake Island Tokyo Hong Kong with this flight then continuing on to New York City via stops in Asia and Europe with the airline also operating nonstop 707 service to Los Angeles and Portland, OR with the latter flight continuing on to Seattle as well as direct 707 jet service from Honolulu to Calcutta, Guam, Jakarta, Karachi, Manila, Rangoon, Saigon and Singapore in 1960. United Airlines was flying nonstop Douglas DC-6 "Mainliner" service from San Francisco in 1947 and by 1961 was operating Douglas DC-8 jet service nonstop from Los Angeles and San Francisco with direct one stop DC-8 flights from both Chicago and New York City . British Commonwealth Pacific Airlines (BCPA) began serving the airport during the mid 1940s with Douglas DC-4 aircraft flying a routing of Sydney Auckland Fiji Canton Island Honolulu San Francisco Vancouver, B.C. In 1950, Northwest Airlines was operating nonstop flights from Seattle with Boeing 377 Stratocruiser propliners and by 1961 Northwest was flying daily Douglas DC-8 jet service on a round trip routing of New York City Chicago Seattle Portland, OR Honolulu. Also in 1950, Canadian Pacific Air Lines (which later became CP Air) was operating service between western Canada and Australia with a routing of Vancouver Honolulu Canton Island Fiji Sydney. Honolulu-based air carriers Aloha Airlines and Hawaiian Airlines had both introduced jet service on their respective inter-island routes in Hawaii by 1966 with Aloha operating British Aircraft Corporation BAC One-Eleven jets and Hawaiian flying Douglas DC-9-10 jets with both airlines also continuing to operate turboprop aircraft on their island services at this time. According to their respective timetables, Aloha was flying Fairchild F-27 and Vickers Viscount propjets while Hawaiian was operating Convair 640 propjets in addition to their new jet aircraft in 1966. Both local air carriers would eventually operate service to the U.S. mainland as well as to the South Pacific while continuing to operate inter-island flights. In 1986, Hawaiian was operating nonstop Lockheed L-1011 Tristar service from Honolulu to Las Vegas, Los Angeles, San Francisco and Seattle as well as one stop direct service to Portland, OR and also nonstop Douglas DC-8 service to Pago Pago with this flight continuing on to Tonga. By 2003, Aloha was flying nonstop Boeing 737-700 service to Burbank, Oakland, Orange County and Vancouver, B.C. with direct one stop service to Las Vegas, Phoenix, Reno and Sacramento in addition to operating nonstop flights to Kwajalein and Pago Pago with one stop service to Majuro and Rarotonga. In the spring of 1969, Braniff International introduced nonstop Boeing 707-320 service to Honolulu from Dallas Love Field, Houston Hobby Airport and St. Louis with one stop direct service from Atlanta, Miami and New Orleans. At the same time, United Airlines introduced daily nonstop Douglas DC-8-62 flights from New York City and was continuing to operate nonstop DC-8 service to Honolulu from Los Angeles and San Francisco. Also in 1969, Western Airlines was operating nonstop Boeing 707 and Boeing 720B service not only from several California cities but from Anchorage, Denver, Minneapolis/St. Paul and Phoenix as well and by 1981 was operating direct one stop McDonnell Douglas DC-10-30 service from London Gatwick Airport via a polar route with a stop in Anchorage. By the mid-1970s Pan Am offered nonstop service from Honolulu to Japan, Guam, Australia, New Zealand and Fiji, as well as to cities on the West Coast. Continental Airlines used Honolulu as a stopover point for charter service to Southeast Asia during the Vietnam War era, and to feed its Guam-based Air Micronesia operation. By the early 1970s, Continental was operating scheduled nonstop flights between Honolulu and Los Angeles, Portland, OR and Seattle with its service including Boeing 747-100 nonstops from Los Angeles and direct one stop 747 flights from Chicago while the Air Micronesia service to Guam via stops at Midway Island, Kwajalein, Majuro, Ponape (now Pohnpei) and Truk (now Chuuk State) was operated with a Boeing 727-100. American Airlines also operated flights to Auckland, Sydney, Fiji and Pago Pago via Honolulu during the early 1970s in addition to operating nonstop Boeing 707320 flights from St. Louis. Over the years, many foreign air carriers used Honolulu as a transpacific stopover point, including Air New Zealand, BOAC (now British Airways), British Commonwealth Pacific Airlines, Canadian Pacific Air Lines, China Airlines, Garuda Indonesia, Japan Airlines, Korean Air, Philippine Airlines, Qantas, Real Transportes Aereos (a Brazilian airline) and Singapore Airlines as well as French air carriers Union de Transports Aeriens (UTA) and its predecessor Transports Aeriens Intercontinentaux (TAI). BOAC served Honolulu as part of its around the world services during the 1960s and early 1970s, first with Bristol Britannia turboprop airliners and later with Boeing 707 and Vickers VC10 jets. Pan Am and Trans World Airlines (TWA) also served Honolulu as a stop on their respective around the world services during the early 1970s. In 1979, Braniff International was operating all of its flights from the airport with Boeing 747 aircraft with nonstops to Dallas/Fort Worth, Guam and Los Angeles as well as one stop direct service to Hong Kong and also one stop direct to Bogota in South America. Several small airlines based in the South Pacific also served Honolulu. In 1983, Air Nauru was operating Boeing 737-200 nonstop flights from Majuro with direct service from Nauru, Air Niugini was flying Boeing 707 aircraft nonstop from Port Moresby, Papua New Guinea and Air Tungaru was operating Boeing 727-100 aircraft nonstop from Christmas Island . Also in 1983, Honolulu-based South Pacific Island Airways was operating nonstop Boeing 707 service from Anchorage, Guam, Pago Pago and Papeete. In April 1974, American Airlines, Braniff International, Continental Airlines, Northwest Airlines, Pan Am, TWA, United Airlines and Western Airlines were all operating nonstop services on domestic routes from the U.S. mainland while CP Air, a Canadian airline, was operating international nonstop service from Vancouver and on to the South Pacific during the mid 1970s. Just over 25 years later in June 1999, U.S.-based air carriers operating domestic nonstop services from the mainland included American Airlines, American Trans Air, Continental, Delta Air Lines, Hawaiian Airlines, Northwest, TWA and United while Air Canada, Canadian Airlines International (the successor to CP Air) and Canada 3000 were operating nonstop services from Canada. On March 24, 2006, Hawaii Governor Linda Lingle unveiled a $2.3 billion modernization program for Hawaii airports over a 12-year period, with $1.7 billion budgeted for Honolulu International Airport. The plan involves implementing short-term projects within the first five years to improve passenger service and increase security and operational efficiencies. As part of the modernization, flight display monitors throughout the airport have been upgraded, new food and beverage vendors have been added, and a new parking garage across from the International Arrivals terminal has been completed. Current projects include an international arrivals corridor with moving sidewalks built atop the breezeway leading to the Ewa Concourse. The first phase of the project was completed in October 2009, while the remainder of the two phase project was completed in 2010. In 2011, Hawaiian Airlines renovated the check-in lobby of the Interisland Terminal, replacing the traditional check-in counters with six circular check-in islands in the middle of the lobbies, which can be used for inter-island, mainland, and international flights. This renovation project was fully funded by Hawaiian Airlines and not a part of the modernization program. Future projects include construction of a Mauka Concourse branching off the Interisland Terminal, the first concourse expansion at Honolulu International Airport in 15 years. Construction of the concourse will involve replacing the existing Commuter Terminal. This new concourse will be for the exclusive use of Hawaiian Airlines, and will allow it to reduce use of overseas terminal gates for international and US mainland flights. This will mean less walking for passengers who check in, clear security, and use the baggage claim at the inter-island terminal. It will also free up gates in the overseas terminal for use by other airlines. Landside plans include construction of a consolidated rental car facility (CONRAC). A temporary rental car center is currently being built in the overseas parking garage so that the existing rental car facilities can be demolished to make way for the new permanent facility. By 2012, Hawaiian Airlines was re-establishing Honolulu International Airport as a connecting hub between the United States mainland and the Asia-Pacific region. That year, according to a Massachusetts Institute of Technology study, the airport had 24% fewer domestic departure flights than it did in 2007. During the 2016 legislative session, the Hawaii state legislature passed a resolution requesting the Department of Transportation to rename Honolulu International Airport for the late U.S. Senator and Medal of Honor recipient Daniel Inouye. The new name first appeared in Federal Aviation Administration documentation on April 27, 2017, and the airport was officially renamed in a ceremony at the airport on May 30, 2017. On June 1, 2018, the Department of Transportation started renumbering all gates and baggage claim numbers. Gates were renamed alphanumerically and baggage claim numbers were renumbered from alphanumerical to numerical. The Hawaii Department of Transportation cited the expansion of existing terminals in the airport as a reason to renumber all gates and baggage claims. Daniel K. Inouye International Airport is part of a centralized state structure governing all of the airports and seaports of Hawaiʻi. The official authority of Honolulu International Airport is the Governor of Hawaiʻi, who appoints the Director of the Hawaiʻi State Department of Transportation who has jurisdiction over the Hawaiʻi Airports Administrator. The Hawaiʻi Airports Administrator oversees six governing bodies: Airports Operations Office, Airports Planning Office, Engineering Branch, Information Technology Office, Staff Services Office, Visitor Information Program Office. Collectively, the six bodies have authority over the four airport districts in Hawaiʻi: Hawaiʻi District, Kauaʻi District, Maui District and the principal Oʻahu District. Honolulu International Airport is a subordinate of the Oʻahu District officials. The airport has four major runways, which it operates in conjunction with the adjacent Hickam Air Force Base. The principal runway designated 8R/26L, also known as the Reef Runway, was the world's first major runway constructed entirely offshore. Completed in 1977, the Reef Runway was a designated alternate landing site for the Space Shuttle. In addition to the four paved runways, Honolulu International Airport has two designated offshore runways designated 8W/26W and 4W/22W for use by seaplanes. The airport covers a total area of 4,220 acres (1,708 ha) of land. The entire terminal complex features twenty-four-hour medical services, restaurants, shopping centers and a business center with conference rooms for private use. Passengers have the option of using various short-term and long-term parking structures on the grounds of Honolulu International Airport. For the 12-month period ending June 30, 2018, the airport had 310,179 aircraft operations, an average of 850 per day. Of these movements 52% were scheduled commercial, 31% air taxi, 12% general aviation and 4% military. There are 200 aircraft based at this airport: 53% single-engine, 17% multi-engine, 16% military, 11% helicopter and 4% jet. All Nippon Airways has its Honolulu Office in Airport Building 47. When Mid-Pacific Airlines was in operations, its headquarters were on the airport property. Daniel K. Inouye International Airport has three terminals: Terminal 1, Terminal 2, and Terminal 3. The Wiki Wiki Shuttle provides inter-terminal transportation between the ticket lobbies of all three terminals and between the concourses in terminals 1 and 2. All gates in terminals 1 and 2 are connected post-security; however, passengers walking from Terminal 1 to gates in Terminal 2 must pass through a USDA agricultural inspection station for carry-on luggage. Effective June 1, 2018, the gate numbers at Daniel K. Inouye International Airport were renamed to an alphanumeric format, and the baggage claim numbers (formerly alphanumeric) were renumbered to numeric. These changes are intended to accommodate expansion with the new Mauka and Diamond Head concourses. Terminal 1, formerly known as the "Interisland Terminal," opened in 1993. The $130 million 8-gate terminal was the largest construction project undertaken at that time by the State Airports Division and replaced an earlier terminal built in 1961. In 1995, a 5-gate extension to the terminal, which also featured a new post-security walkway to Terminal 2 (formerly known as the "Overseas Terminal") opened. Terminal 1 houses Hawaiian Airlines (interisland and U.S. Mainland flights). Terminal 1 has 13 gates. Terminal 2, formerly known as the "Overseas Terminal," opened on August 22, 1962. From 1970 through 1978, architect Vladimir Ossipoff designed a terminal modernization project that remodeled this terminal and created several additions, which included the Diamond Head Concourse in 1970, the Ewa Concourse in 1972, and the Central Concourse in 1980. Terminal 2 houses AirAsia X, Air Canada, Air China, Air New Zealand, Alaska Airlines, All Nippon Airways, American Airlines, Asiana Airlines, Boyd Vacations Hawaii, China Airlines, China Eastern Airlines, Delta Airlines, Fiji Airways, Hawaiian Airlines (international flights) Japan Airlines, Jetstar Airways, Jin Air, Korean Air, Philippine Airlines, Qantas, Scoot, Sun Country Airlines, United Airlines, and WestJet. Terminal 2 has 29 gates across three concourses. All gates in the terminal are designated as common-use, shared among all the airlines. No gates are assigned to any specific airline and can change daily based on need. Terminal 3, formerly known as the "Commuter Terminal," opened on May 29, 2018 between the Delta and United Cargo facilities on the Diamond Head side of the airport. The terminal was originally a single-story facility located north of Terminal 1 adjacent to Nimitz Highway, but was closed on June 1, 2018 for demolition in order to make way for the Mauka Concourse expansion of Terminal 1. Originally a larger replacement commuter terminal was planned to be built on the Diamond Head side of the airport, but those plans were ultimately canceled. This was largely due to bankruptcy of three of the four airlines occupying the terminal and the higher-than-expected cost of the project. Terminal 3 houses Mokulele Airlines. All boarding and deplaning are conducted directly on the apron. Terminal 3 has one ground-level gate. A number of fixed-base operators are located along Lagoon Drive on the airport's southeastern perimeter. While these focus on general aviation services, there are a few small passenger airline operations that operate from these facilities, rather than from the main terminal complex. Air tour flights typically depart from this area as well. The largest airline at Honolulu airport is Hawaiian Airlines offering 13,365 seats per day, which represents a 45% market share. The No. 2 and No. 3 carriers are United and Japan Airlines (JAL) with 7.7% and 7.4% market share respectively. Traffic between Honolulu and the mainland United States is dominated by flights to and from Los Angeles and San Francisco. These two cities, plus Seattle, account for around half of all flights between the mainland and Honolulu. Hawaiian Airlines, with 11 routes, has the highest market share on routes between Honolulu and the continental United States. Internationally, Japan is the dominant market. Two-thirds of international seats head for Nagoya, Osaka, and Tokyo (both Haneda and Narita airports) with services provided by Japan Airlines, Air Japan, China Airlines, Korean Airlines, Delta, Hawaiian, or United. Narita alone is served with 61 weekly departures and is the second busiest international route from the United States, trailing only the lucrative John F. Kennedy Airport-London Heathrow route. Other major international routes are to Seoul (25 weekly departures operated by Korean Airlines, Asiana Airlines, Hawaiian, and Jin Air), Sydney (12 weekly departures operated by Hawaiian, Jetstar and Qantas) and Vancouver (19 weekly departures split between Air Canada and Westjet). In October 2009, China-based Hainan Airlines was granted approval for a nonstop flight from Honolulu to Beijing. It would be the first mainland Chinese carrier to serve Hawaii and the airline's second US destination after Seattle. The airline originally planned to launch the service by the summer of 2010, but the route has been further delayed due to visa concerns and landing fees. China Eastern, however, announced that it will begin nonstop flights from Honolulu to Shanghai on August 9, 2011 instead, marking the first ever direct, regularly scheduled service between China and Hawaii. On January 21, 2014, Air China launched the second China-Hawaii route with nonstop flights from Honolulu to Beijing, also the first nonstop route between the 2 cities. Las Vegas based Allegiant Air used to offer once-weekly non-stop service to many smaller markets in the mainland Western United States. These cities included Bellingham, Boise, Eugene, Fresno, Spokane, and Stockton. Allegiant still offers service to Las Vegas and Los Angeles. It was announced that Allegiant plans to drop service to Honolulu altogether in August 2016. TheBus routes 19, 20, and 31 stop on the upper (departure) level of the airport. Routes 19 and 20 connect the airport to Pearlridge Center (20 only), Hickam AFB (19 only), Downtown Honolulu, Ala Moana Center, and Waikiki. Route 31 connects the airport to Tripler Army Medical Center, via Kalihi Transit Center. Routes 9, 40, 42, and 51 run on Nimitz Highway within walking distance of the airport. 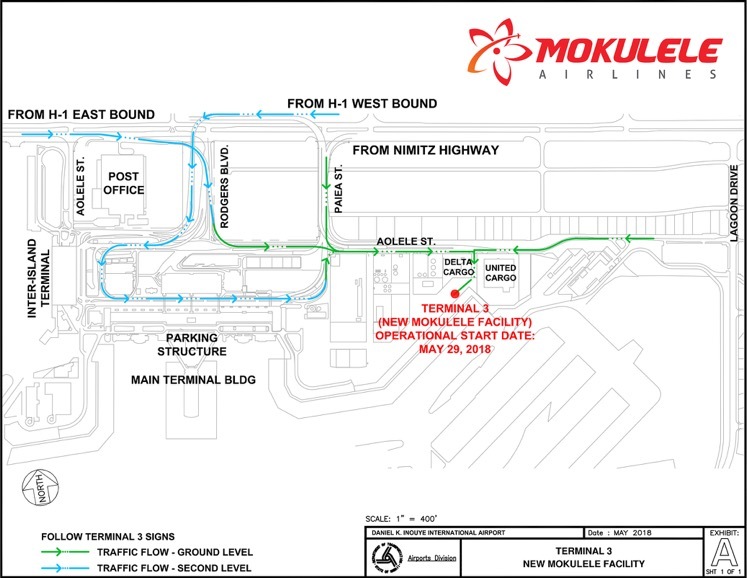 When Honolulu Rail Transit phase II opens in 2025, there will be a station at the airport connecting it to Downtown Honolulu and points west of the airport. On March 22, 1955, a United States Navy Douglas R6D-1 Liftmaster transport on descent to a landing in darkness and heavy rain strayed off course and crashed into Pali Kea Peak in the southern part of Oahu's Waianae Range, killing all 66 people on board. It remains the worst air disaster in Hawaii's history and the deadliest heavier-than-air accident in the history of U.S. naval aviation. On July 22, 1962, Canadian Pacific Air Lines Flight 301, a Bristol Britannia 314 crashed while it attempted a "go-around". 27 of the 40 passengers and crew on board were killed. Vickers Viscount N7410 of Aloha Airlines was damaged beyond repair when it collided on the ground with Douglas DC-9-31 N906H of Hawaiian Airlines on June 27, 1969. On August 8, 1971, Vickers Viscount N7415 of Aloha Airlines was damaged beyond economic repair when a fire broke out upon landing. Pan Am Flight 830: a Boeing 747-121, a bomb exploded aboard as the aircraft prepared for approach to Honolulu from Tokyo on August 11, 1982. One teenager was killed and 15 others were injured. The aircraft did not disintegrate, and made a safe emergency landing in Honolulu. Aloha Airlines Flight 243: a Boeing 737-297 flying from Hilo to Honolulu International Airport on April 28, 1988, experienced a rapid decompression. An 18-foot-long (5.5 m) section of the fuselage roof and sides were torn from the airplane, due to metal fatigue. Out of the 89 passengers and 6 crew members, the only fatality was a flight attendant blown out of the airplane. Several passengers sustained life-threatening injuries. The aircraft diverted to Kahului Airport. United Airlines Flight 811: a Boeing 747 carrying 3 flight crew, 15 cabin crew and 337 passengers from Honolulu to Auckland on February 24, 1989, suffered rapid decompression when a cargo door separated from the aircraft after takeoff from the Reef Runway. Nine passengers were swept from the aircraft. The plane returned to Honolulu. Bojinka plot: a plot discovered by United States and Filipino intelligence authorities after a fire in a Manila apartment, included in its first phase the planned detonation of bombs aboard several flights inbound to, or outbound from, Honolulu on January 21, 1995. The Bojinka plot later developed into the September 11 attacks. On February 2, 2016, the pilot of a Cessna 337 Skymaster, making a trip to nearby Kalaeloa Airport from Honolulu International Airport, discovered his landing gear would not extend. After holding for 2 hours to burn fuel, he made an emergency water landing in Sea Lane 4/22 off of Lagoon Drive. The 68-year-old pilot did not require transportation to the hospital. The airport has been featured in several episodes of the Hawaii Five-0 (2010) television series, as well as in the 2006 film, Snakes on a Plane, and the 2014 film Godzilla. The latter was actually only featured in a single exterior shot as all scenes filmed at the "airport" were actually filmed in Vancouver, British Columbia. ^ Staff, Web (April 29, 2017). "Honolulu airport renamed after late Sen. Daniel Inouye". Khon2.com. Retrieved May 20, 2017. ^ "The State of Hawaii Airport Activity Statistics By Year 2007-1994" Archived June 26, 2008, at the Wayback Machine, Department of Transportation, Airports Division, State of Hawaii. ^ "Honolulu CDP, HI Archived February 18, 2008, at the Wayback Machine." U.S. Census Bureau. Retrieved on May 21, 2009. ^ "2012 North American Airport Traffic Summary (Top 50 Airports Passengers, Cargo, Movements)". Airports Council International. Retrieved October 4, 2013. ^ "List of NPIAS Airports" (PDF). FAA.gov. Federal Aviation Administration. 21 October 2016. Retrieved 23 December 2016. ^ "HNL 19601969". Hawaii Department of Transportation, Airports Division. 2007. Retrieved July 8, 2009. ^ Trevor James Constable (2008). "ACKNOWLEDGMENTS: A detailed review of participants in and their contributions to etheric rain engineering since 1968". Etheric Rain Engineering Pte. Ltd. Retrieved July 8, 2009. ^ Genocchio, Benjamin (September 26, 2008). "A Hawaiian Modernist, by Way of Russia". The New York Times. New York, NY: The New York Times Company. Retrieved September 28, 2013. ^ Ossipoff, Vladimir; Sakamoto, Dean (2007). Hawaiian modern : the architecture of Vladimir Ossipoff. et al. Honolulu, HI & New Haven, CT: Honolulu Academy of Arts; in Association with Yale University Press. pp. xiii, 101104, 178, 200201. ISBN 9780300121469. OCLC 145377930. Retrieved September 28, 2013. ^ "DOT Public Affairs Press Kits". Web.archive.org. Archived from the original on June 26, 2002. Retrieved September 28, 2013. 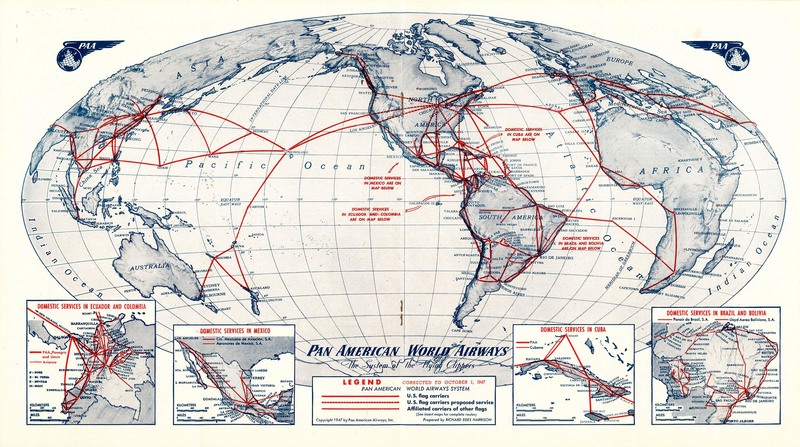 ^ "Pan Am route map, 1946". Retrieved February 24, 2014. 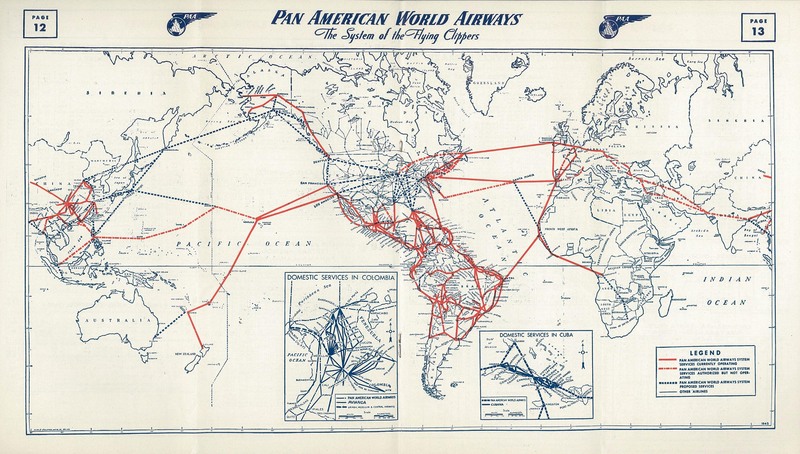 ^ "Pan Am route map, 1947". Retrieved February 24, 2014. ^ "1973 route map". Retrieved February 24, 2014. ^ "1966 June 1 Continental Airlines Timetables, Route Maps, and History". Airchive. Retrieved February 24, 2014. ^ "1970 September 14 American Airlines Timetables, Route Maps, and History". Airchive. Retrieved February 24, 2014. ^ "Airlines and Aircraft Serving Honolulu Effective November 15, 1979". Retrieved February 24, 2014. ^ "About the Program". Hawaii Airports Modernization Project. Retrieved July 8, 2009. ^ Reyes, B.J. (March 25, 2006). "$2.3B airports upgrade proposed". Honolulu Star-Bulletin. Retrieved October 1, 2008. ^ "New International Arrivals Corridor Opens at Honolulu International Airport". Office of the Governor. Retrieved January 3, 2010. ^ "What We're Doing Now: Honolulu International Airport". Hawaii Airports Modernization Project. Retrieved July 8, 2009. ^ Russell, Edward. "ANALYSIS: Honolulu's reascendant connecting hub." Flightglobal. October 30, 2012. Retrieved on October 30, 2012. ^ Staff. "MIT study: Number of flights from Honolulu fell 24% in five years." Pacific Business News. May 8, 2013. Retrieved on May 9, 2013. ^ "Hawaii State Legislature". Capitol.hawaii.gov. Retrieved 2017-04-29. ^ "Honolulu airport renamed after late Sen. Daniel Inouye". KHON2. 2017-04-29. Retrieved 2017-04-29. ^ "HNL gates and baggage claims to receive new numbers beginning June 1, 2018 as part of the Airport Modernization Plan". Hidot.hawaii.gov. Retrieved 1 June 2018. ^ "Chronology of Aviation in Hawaii: 19801989". Hawaii Aviation. State of Hawaii Department of Transportation. ^ "AirportIQ 5010". GCR Inc. Retrieved September 2, 2018. ^ "ANA City offices/Honolulu." All Nippon Airways. Retrieved on August 13, 2011. "Honolulu 300 Rodgers Bldg. No. 47 Honolulu International Airport Honolulu, HI. 96819"
^ "World Airline Directory." Flight International. May 16, 1981. 1452. "Head Office: Honolulu International Airport, Hawaii, USA." ^ Morales, Manolo (11 May 2018). "New gate numbers slated for Daniel K. Inouye International Airport". KHON. Retrieved 12 May 2018. ^ "Airports | HNL gates and baggage claims to receive new numbers beginning June 1, 2018 as part of the Airport Modernization Plan". Hidot.hawaii.gov. Retrieved 2018-05-16. ^ a b "Hawaii Aviation | HNL 1990s". Aviation.hawaii.gov. Retrieved 2018-09-27. ^ "New HNL Signage". Hawaiian Airlines. Retrieved 2018-09-27. ^ "Hawaii Aviation | HNL 1960s". Aviation.hawaii.gov. Retrieved 2018-09-27. ^ Genocchio, Benjamin. "A Hawaiian Modernist, by Way of Russia". Retrieved 2018-09-27. ^ "Hawaii Aviation | HNL 1970s". Aviation.hawaii.gov. Retrieved 2018-09-27. ^ "Hawaii Aviation | HNL 1980s". Aviation.hawaii.gov. Retrieved 2018-09-27. ^ "Department of Transportation | Mokulele Airlines is moving to new location at the Daniel K. Inouye International Airport beginning May 29, 2018". Hidot.hawaii.gov. Retrieved 2018-06-04. ^ "Department of Transportation | HDOT breaks ground on new Mauka Concourse at the Daniel K. Inouye International Airport". Hidot.hawaii.gov. Retrieved 2018-06-04. ^ Lincoln, Mileka. "State cancels plans to build new commuter terminal at Honolulu airport". Retrieved 2018-06-04. ^ "AirAsia | Flight Schedule". Retrieved 20 March 2018. ^ "Flight Schedules". Air Canada. ^ "Flight Timetable". Retrieved 20 March 2018. ^ "Flight Timetables Flight information". Retrieved 18 March 2018. ^ "Timetables [International Routes]". Retrieved 20 March 2018. ^ "Flight schedules and notifications". Retrieved 20 March 2018. ^ "Routes of Service". Retrieved 20 March 2018. ^ "Timetable | China Airlines". Retrieved 20 March 2018. ^ "Flight Status". Retrieved 20 March 2018. ^ Ltd. 2019, UBM (UK). "Delta cancels Honolulu Fukuoka service from May 2019". Routesonline. Retrieved January 23, 2019. ^ Ltd. 2019, UBM (UK). "Delta resumes Detroit Honolulu from late-June 2019". Routesonline. Retrieved January 23, 2019. ^ "FLIGHT SCHEDULES". Delta.com. Retrieved 20 March 2018. ^ "Flight Schedules". Fijiairways.com. Retrieved 20 March 2018. ^ a b "Destinations". Retrieved March 20, 2018. ^ "Japan Airlines Timetables". Retrieved 20 March 2018. ^ "Route Map | Jetstar Airways". Retrieved 20 March 2018. ^ "Route Map | Jin Air". Retrieved 20 March 2018. ^ "Flight Status and Schedules". Korean Air. ^ "Flight Schedule | Mokulele Airlines". Retrieved 20 March 2018. ^ "Flight Schedule". Retrieved 20 March 2018. ^ "Qantas Timetables". Retrieved 20 March 2018. ^ "Scoot moves forward Honolulu service cancellation to early-May 2019". AirlineRoute. March 20, 2019. Retrieved March 20, 2019. ^ a b Gilbertson, Dawn (March 4, 2019). "Tickets on sale from $49 for new Southwest Airlines Hawaii flights beginning March 17". USA Today. Gannett Satellite Information Network, LLC. Retrieved March 4, 2019. ^ Chris McGinnis (January 8, 2019). "Sun Country Airlines to fly to Hawaii from SFO". Sfgate.com. Retrieved January 23, 2019. ^ "Sun Country Airlines". Retrieved March 20, 2018. ^ "Timetable". Retrieved 20 March 2018. ^ "Flight schedules". Retrieved 20 March 2018. ^ a b "Hawaiian Airlines poised to expand partnerships with Asian carriers, boosting Honolulu's hub status". Anna.aero. September 19, 2008. ^ "Hawaiian Airlines poised to expand partnerships with Asian carriers, boosting Honolulu's hub status". CAPA Centre for Aviation. September 8, 2014. ^ U.S. International passenger and Freight Statistics. USDoT. 2013. ^ Dingeman, Robbie (October 12, 2009). "Hainan Air approved for Honolulu-Beijing service". USA Today. Tysons Corner, VA, United States: Gannett Company. Archived from the original on January 25, 2013. Retrieved January 25, 2013. ^ Direct route to China delayed, Honolulu Star-Advertiser, August 15, 2010. ^ "Airline sets a date for China flights to Hawaii Hawaii News Now KGMB and KHNL". Hawaii News Now. June 16, 2011. Retrieved August 13, 2012. ^ "China-Hawai'i service begins". KPUA. January 21, 2014. Archived from the original on January 22, 2014. Retrieved January 22, 2014. ^ "Allegiant Air to cut Hawaii routes down to two". June 18, 2014. Retrieved February 17, 2015. ^ "Allegiant Air to end Hawaii service in 2016". Hawaii News Now. November 18, 2015. ^ "RITA | BTS | Transtats". Transtats.bts.gov. January 2017. Retrieved May 1, 2017. ^ "U.S. International Air Passenger and Freight Statistics Report". USDoT. October 14, 2014. Retrieved February 16, 2015. ^ "RITA | BTS | Transtats". Transtats.bts.gov. Feb 2016. Retrieved February 27, 2017. ^ "Passengers Interisland & Overseas". Hawaii.gov. ^ "Airport Activity Statistics by Calendar Year. Retrieved on Mar 29, 2015" (PDF). Hawaii.gov. Retrieved May 20, 2017. ^ "Airport Traffic Reports". Aci-na.org. ^ "HART unveils plans for rail station at Honolulu International Airport". KHON2.com. July 16, 2014. Retrieved 15 December 2014. ^ Harro Ranter (March 22, 1955). "Aviation Safety Network Aircraft Accident Douglas R6D-1 (DC-6) 131612 Honolulu, HI". Aviation Safety. Retrieved October 23, 2014. ^ Associated Press, "66 Killed as Navy Plane Hits Hawaiian Peak," St. Louis Post-Dispatch, story dated March 22, 1955, quoted in full at lifegrid.com Charles J. Coombs, Jr.
^ "Chronology of Significant Events in Naval Aviation: "Naval Air Transport" 1941 1999". Vrc 50. Retrieved October 23, 2014. ^ Grossnick, Roy A., United States Naval Aviation 19101995, Washington, D.C.: Naval Historical Center, undated Archived September 12, 2012, at the Wayback Machine ISBN 0-945274-34-3, p. 206. ^ "Accident description". Aviation Safety Network. Retrieved October 7, 2009. ^ "Accident description". Aviation Safety Network. Retrieved October 8, 2009. ^ "Pilot safe after landing plane in Keehi Lagoon". Honolulu Star Advertiser. Retrieved February 2, 2016. This article based on this article: Honolulu_International_Airport from the free encyclopedia Wikipedia and work with the GNU Free Documentation License. In Wikipedia is this list of the authors .